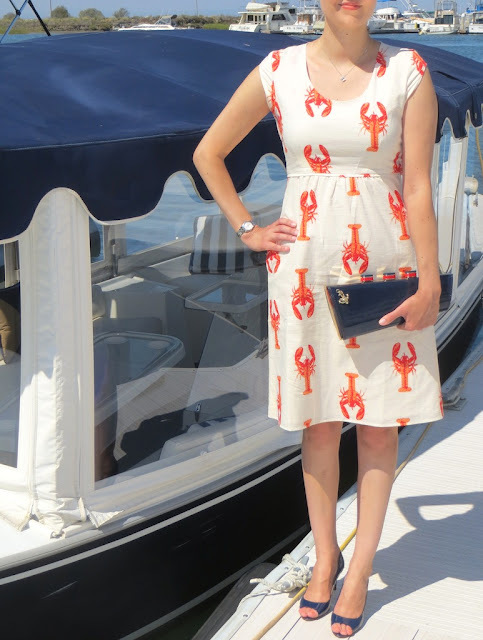 I'll admit that the lobster dress with the ship clutch is a bit much in regard to the nautical theme, but I couldn't help it. 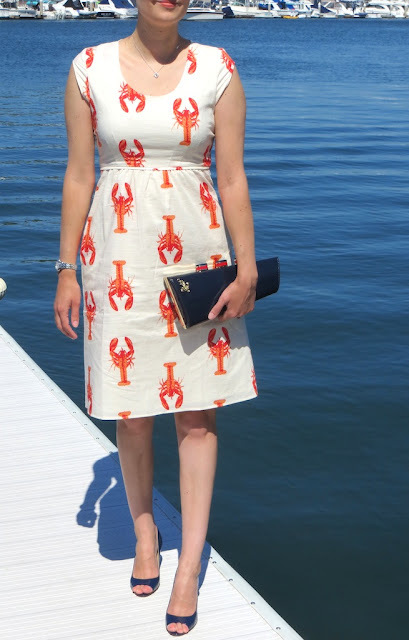 Last weekend when we went to the beach we took my husband's grandmother and great aunt to tea, so I wanted to dress up a bit for the occasion. 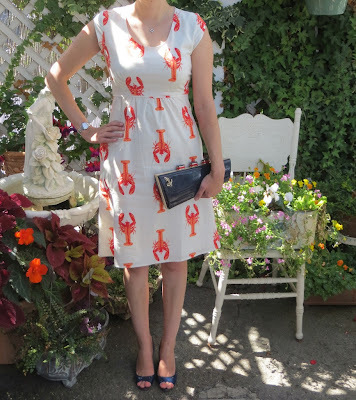 I've actually been searching high and low for a lobster dress for quite sometime now (I know it's sort of a random thing to be looking for) and when this one popped up on Modcloth, I knew it was a catch. 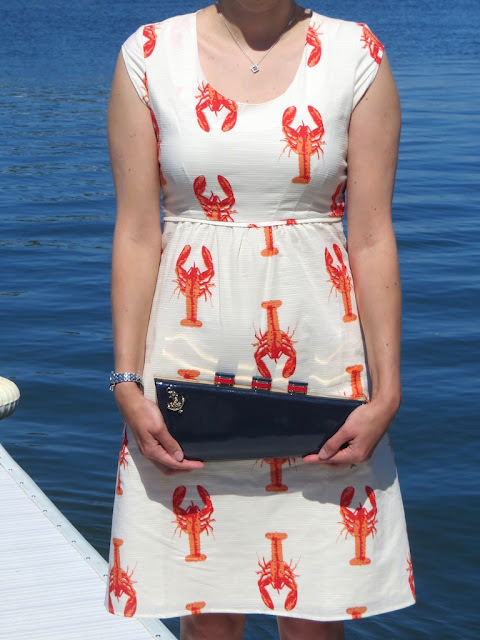 Named the "Maine Event" dress by the people at Modcloth, I think it sold out in a matter of days. Apparently others were also seeking out a lobster dress as well. I guess we have the Salvador Dali/Schiaparelli collaboration from decades past to thank for the enduring craze of these crustaceans. 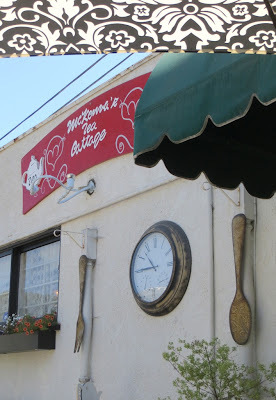 The tea house we went to was quaint and embraced the shabby chic aesthetic with mismatched tea pots, cups and saucers. We sat outside which was perfect given the balmy day. Where I am standing in the last picture is the small garden they created on the patio for guests to enjoy. 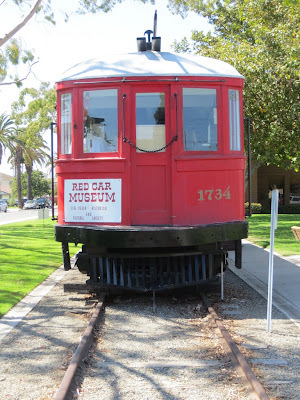 Across the street we had a view of the Red Car museum, which is a restored electric rail car that formerly ran along a 40 mile stretch from LA to Newport from 1925 when it was built until the early 50s. The Red Car museum features a small but fascinating collection of artifacts documenting the Red Car's history as well as some interesting photos and antiques from the bygone days of the city of Seal Beach. I love afternoon tea - and that looks like such a cozy place to do so! You look so fashionable here Katie! Yes, afternoon tea is so much fun! This turned out to be a very nice place to relax for the afternoon and sip tea.